I collected all the parts to build one. It took me quite a while but it was really worth the time. This chassis is very easy to build up. It makes a lot of fun - for me more than driving. More modifications: You can mount wheels from the 1:10 scale models (TA02-chassis) by using the wheel hubs from the MadBull. I would replace the rear shock ends with metal parts (e.g. GPM) because they can break quickly. 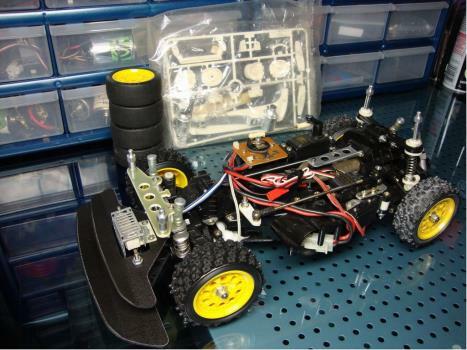 In my experience the chassis is very fragile, especially the R and C-parts. So leaving the car in the shelf is not bad idea. Meanwhile spare parts are very rare, so keeping a runner can be expensive. The repro body from Kamtec fortunately gives you a cheap possibility the leave the original body in the shelf when you are running this kit. For me this kit is one of the nicest kits Tamiya ever made. Awesome look, sophisticated concept and a lot fun to build it! Hi there RC fans. Last week i've finished the restoration of my Porsche 959. I would like to share you my personal story about the 959. From the first time i saw it till i turned 'ON' my transmitter to discover some of 'Tamiya feeling'. I will give my personal opinion about the different phases of building/restoring and driving this car. It all began when i picked up my old RC hobby again. I searched the internet and landed here at TamiyaClub.com. I'd never had seen such a complete site, that had a complete list, include pics, of all RC cars Tamiya produced. Here i first saw the Porsche 959. I watched some pics from members and from that moment on i knew i wanted to find myself a 959. I watched ebay and the 'tradingroom' but there was nothing special. Then i visit a dutch auction site. There was a guy that had one for sale for 150 euro's. It was used, but in fair condition. I called the guy and asked why he was selling the 959. He told me that he had far more interest in Tamiya models from the 'metal' eara. I offered 130 euro and that was allright with him. I payed the guy and 4 days the mailman delivered a nice box. I opened it, and there it was. My own 959. The first thing that went trough my mind was: Wow that's one heck of a small car! I took the body off and discovered that there was much to clean. The whole car was washed with some kind of yellow clay. I took a toothbrush and started cleaning every bit by bit. While i was cleaning the parts i found some parts that were broken or missing. From that moment i kept an eye on ebay and bought all the parts i needed. 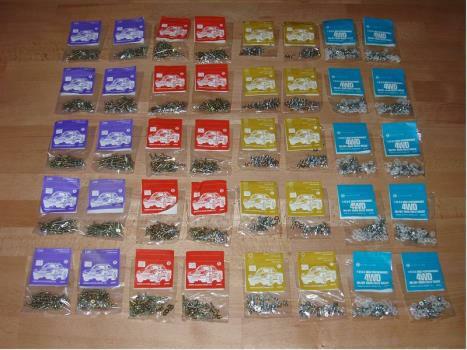 I heared that some parts are very expensive, but i found many parts for very reasonable price. Bit by bit the 959 returned back to life. When i had most parts new i started building the parts together. I was lucky to have the building plan with me. I started with both gear-cases. Especially the rear gearbox is very nice example of a complex design. Very small parts fit together perfectly and creating a working mechnism. Superb. I really began to love this car!!! The rest of the building was not that difficult. It's just the normal Tamiya idea about step-by-step building. Note-If you wish to go completly crazy, build yourself a dozen oil-filled dampers AIRBUBBLES!!!!! 4 evenings later i finally finished them without a single bubble found. I placed the 959 on a shelf and 1 week later i took a look at the dampers.......WHAT!!!! Airbubbles in all 4 of them! I gave up the idea to try and remove them because the bubbles constantly comming back. They'll drive completly mad!!!! Than the moment came the 959 was on his 'feet' and was ready to drive. I made a deal with myself to drive it only 1 time, for 1 full battery-run. This, to not make my new 959 used again. I installed all radio gear and a 1700mha battery. Turned on my transmitter and adjusted the steering and put it on the ground, gave it a little and slow run before giving it full throttle. Thanks to my new Technigold engine the speed was not normal anymore. I became allmost to frightened to drive it!!! The rest of the run i drove with the bodyshell on it. Very nice sight!! Only thing is the handling. Ver,very much oversteer when driving low speed and much understeer when driving at higher speeds. Looking at this you see it's a classic RC car. At this moment a NIB body shell is on it's way. Can't wait to recieve it! - Vey nice and lovely car to have, restore, drive. - It can cost you very much if you want to have all of the part new. - Some parts are difficult to find. When you see them, buy them! - The restoration is a very nice job. You really can see how complex it is. - Buy yourself a used one in good condition rather then a runner that is completly smashed. 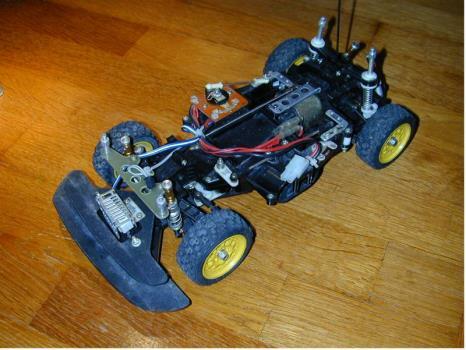 The reason they cancelled the production of this RC car is due to money. I spoke a guy that had some contact with Mr.Tamiya himself. 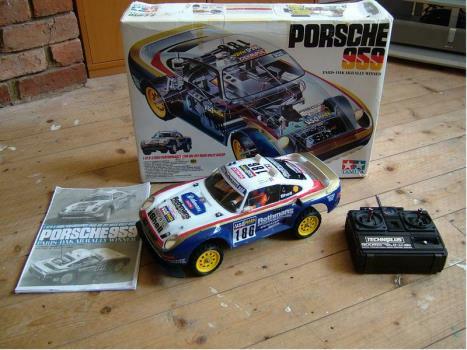 The story is that Porsche asked Tamiya to build a RC car as advertisement for there new 959 streetcar. Tamiya agreed, and designed a very, very nice and detailled body shell. 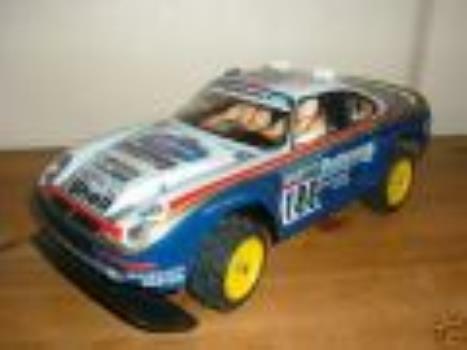 Tamiya payed Porsche money for the design of the body shell. Due to the very dissapointing sales of the real 1:1 959, Porsche wanted more money from all of the company's that made scale models of the 959. Also Tamiya had to pay more money for the rights of the Porsche design. Tamiya refused and the production stoped. 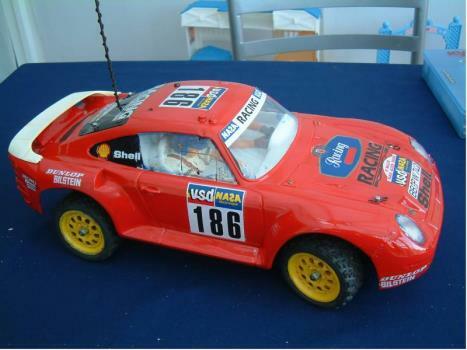 When Tamiya stopped the production, Porsche wanted to have the mold of the body. Tamiya refused agian and they distroyed all of the 959 molds. For this reason there will never be a re-issue of the Porsche again. I hoped you liked my story. Well what can I say - a complete masterpiece! From the moment you open the box and look at all of the parts you know you are in for a challenge - there are millions of them and the chassis is so much more complicated than any modern one. The instructions are the usual perfect Tamiya productions... complex but logical. Again, as usual, the parts are molded and cut to within a thousandth of a millimetre so despite the complexity you never have to force anything. As it goes together it becomes more and more beautiful... in fact you almost want 4 or 5 so you can keep them in various stages of build! The gearboxes are fully ball braced and it all fits together so cleverly. The only part I found really hard to do was the dampers... they are different to any others I have made, and getting the airbubbles out is a nightmare!!! It must have taken me two nights to just do the 4 of them, and I have just seen a little bubble appear in one of them... I guess I am going to need to find some more of the rubber hose used at the top of the damper because once you have sealed it, the only way to open it is to cut the tube. The only improvement I would like to see is the replacement of the white plastic parts. They are probably fine, but they feel too fragile, even compared to the black plastic that makes up the bulk of it. The white parts are particularly concerning because they appear in the areas that take the most stress, particulalry the sockets for the front suspension, the steering levers, and the join between the front chassis and engine bay. If anybody wants to mill some aluminium bits I will definately buy them! Because this is going to be a runner, I am planning on using an ESC or even an Adspec CPR - the MSC just seems too harsh for a motor like the Technigold. The only problem I need ot overcome is how to connect the lights. Finally, the body remains to be painted, and I have to admit I am being an absolute wimp about this. The paint job is complex and the decals look a nightmare. The body is also amazingly thin lexan and feels so fragile. I may well line the front and rear and the wheel-arches with aluminium tape once painted to provide extra strength and flexibility. Highoy recommended - a true gem!